A-1 Well Drilling offers complete services from new pump installation to pressure tanks and related components. Many pump failures are simple fixes and A-1 Well Drilling makes every effort to minimize your cost. A-1 Well Drilling now offers well inspections complete with a new down-the-hole camera to solve any potential problems. Rehabilitation of old wells is sometimes a solution helping to minimize your cost. 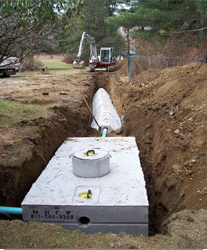 A-1 Well Drilling is also licensed to install basic septic tank waste water systems. From soil analysis to permits, A-1 Well Drilling can do it all. The company installs new water lines for homes, barns and outside hydrants. A-1 Well Drilling also installs automatic cattle watering systems. Missouri Licensed 003596WP and Insured.